The Census, released today at the Collab/Collide Summit in Melbourne, finds that the Australian fintech ecosystem has blossomed over the past 12 months, although far more work needs to be done for the industry to reach its full potential. Based on survey results from 166 fintech companies, the Census is the only comprehensive industry-backed analysis of the Australian fintech industry. Now in its second year, the Census was the first fintech industry census in the world and remains the only report of its type in Asia. Median monthly revenue growth by post-revenue fintech companies was 208% (or 3.1 times) from June 2016 to June 2017. About a quarter (24%) of fintechs are reporting that revenue growth increased by more than 700%. The main targets for expansion are the United Kingdom (49%), Singapore (40%), United States (38%), New Zealand (27%) and Hong Kong and Canada (22%). Improving the research and development initiative (87% support), government mandated open data controls (85%), capital gains tax relief (85%), reduced payroll and other taxes (83%) and more transparent access to the New Payments Platform (82%) top the list of the industry growth initiatives voted as most effective by fintechs. As the fintech industry matures, and customer acquisition and growth becomes a priority, fintechs are reporting increasing talent pool shortages in sales and marketing, with engineering talent still remaining a challenge. 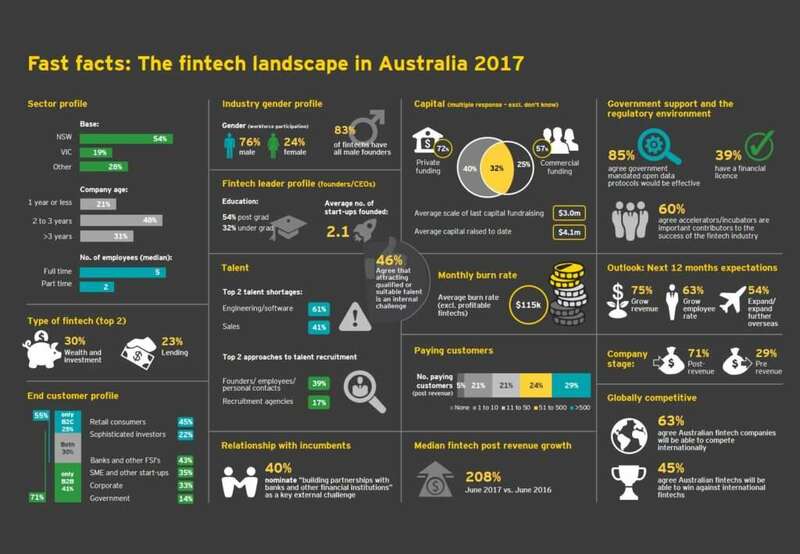 The Census results closely align with another research report, the 2017 EY FinTech Adoption Index, which in June 2017 found that Australia has leap-frogged Hong Kong, Singapore and the United States to have among the best fintech market penetration in the world. A total of 37 per cent of Australia’s digitally active population are now fintech users, compared to 13 per cent in 2015. FinTech Australia Chair Simon Cant said the Census results illustrated that Australia’s fintech industry was increasingly becoming the first choice of financial services for many Australians. “Equally so, it is exciting to see that fintech firms are now sufficiently comfortable with their domestic positions to be increasingly planning international expansions. This is another sign of a healthy and maturing industry. FinTech Australia Deputy Chair and Census Founder Stuart Stoyan said the Census provided a strong evidence base to help FinTech Australia to advocate for policy and regulatory change. “It’s become clear from this year’s Census that taxation reform, specifically around providing better access to research and development incentives and capital gains tax relief, and a mandated open financial data platform are key policy priorities for fintech firms around the country,” Mr Stoyan said. Mr Stoyan said that FinTech Australia had been, and would continue to, drive increased female participation in the industry. “Our programs have included a speaker gender equality target at the Intersekt Festival, ensuring at least 30% of the FinTech Australia board are women and by promoting a Female FinTech Leader of the Year award at our annual Finnies awards,” he said. 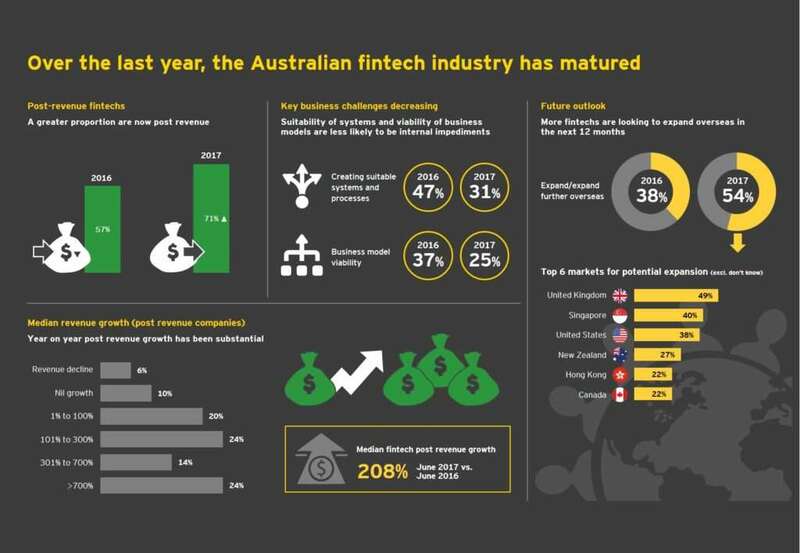 EY FinTech advisor Meredith Angwin said the latest Census results reflected some of the significant advancements made by the Australian fintech sector over the past twelve months. “With the 2016 Census, we saw a snapshot of a sector that, while growing, was still in its relative infancy,” Ms Angwin said. “This year’s results though show that Australian fintech has really started to come of age, with substantial increases in the proportion of fintechs that are now post revenue as well as those that are planning international expansion. A fact sheet on the Census findings is available here. The full Census can be found here.